COSTA MESA, Calif. – A traffic collision that occurred tonight, March 19, 2019, resulted in the death of a motorcyclist at the scene. The name of the deceased is being withheld until next of kin is notified. 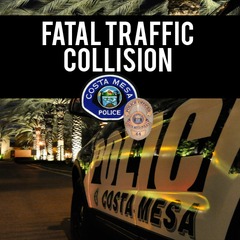 At approximately 8:50 p.m., Costa Mesa Police Department (CMPD) officers and Costa Mesa Fire & Rescue responded to a traffic collision involving a 23-year-old male motorcyclist and a driver in a silver Nissan sedan on Fairview Road and Adams Avenue. The motorcyclist and the driver collided as the sedan was traveling westbound on El Camino Drive, which turns into Adams Avenue, and the motorcyclist was traveling northbound on Fairview Road. The motorcyclist was subsequently pronounced deceased at the scene. The driver of the vehicle involved was uninjured and remained at the scene and cooperated with CMPD. The CMPD Major Accident Investigation Team (MAIT) responded to the scene and began their investigation. At this time we have no further information about the incident. CMPD is asking anyone with additional information about the fatal traffic collision to contact Traffic Investigator Darren Wood at (714) 754-5264. Media is asked to contact the Public Affairs Manager and not the investigator listed in the above information if prompt assistance is needed.